Snow covered windowsills and pouring rain is a great excuse to stay inside on a cold evening. Before you snuggle up on the couch, spend some time in the kitchen and make some tempting, spicy, and satisfying movie snacks that can also be enough for a meal. Pass the popcorn please! Preheat oven to 400°F. Place the corn kernels and the oil in a large skillet. Heat the large skillet over high heat. Immediately cover with a large lid and reduce the heat to medium low. Cook the kernels 3 to 4 minutes, shaking the covered skillet occasionally until the popping slows and the lid is pushed up from the popped corn. In a large bowl, whisk the lime zest, juice, grated cheese, both chili powders, soy sauce, sugar and black pepper. Transfer the popped corn to a large bowl and toss with the spice mixture to coat. 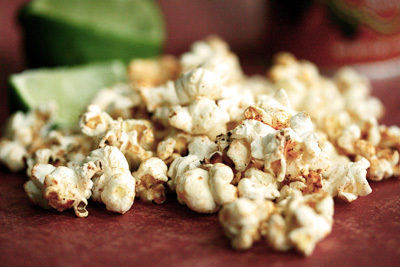 Transfer to a large baking sheet and bake 5 to 6 minutes stirring once until the popcorn is dry and fragrant. Serve immediately or transfer to an air tight container. Store on the counter top for up to one week. Nutritional Stats Per Serving (1 cup): 58 calories, 1 g protein, 7 g carbohydrates, 3 g fat (0 g saturated), 1 mg cholesterol, 1 g fiber, 82 mg sodium.